QUEENSLAND, Australia (PRWEB) December 01, 2018 – Like an orchestra in rehearsal, hard and soft corals on Moore Reef off the coast of Cairns, Queensland slowly began releasing eggs and sperm on Tuesday night ahead of what marine biologists believe will be a mass synchronized coral spawning event on the Great Barrier Reef starting Thursday, November 29th. While Marine biologists and veteran coral chasers, Stuart Ireland from Calypso Productions, Gareth Phillips from Reef Teach and Pablo Cogollos from Sunlover Reef Cruises were based at Sunlover Moore Reef pontoon, 29 miles off the coast of Cairns to film the event for marine enthusiasts around the world, a group of leading coral scientists are set to deploy the most ambitious coral reseeding project ever undertaken. Led by Professor Peter Harrison, the man who first discovered coral spawning in 1982, the team will harvest millions of coral eggs and sperm from nearby reefs to grow new coral Larvae which will be released back onto damaged reefs in the Vlasoff and Arlington Reef area off Cairns. Both scientific parties agree that a successful spawning will be proof that the Reef is resilient and has potential to recover from the back-to-back bleaching events of 2016 and 2017. 2018 marks the 22nd time that Mr. Ireland has captured the Great Barrier Reef as it erupts into a new cycle of life. This year is the seventh time he will document the event from Sunlover’s Moore Reef pontoon, which is noted for its wide variety of adjacent corals as well as the practicalities of offering a stable base to light the Reef for filming. 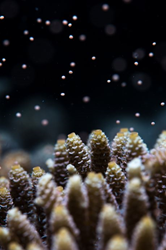 “Thursday was the main event as Acropora, Montipora and other stony corals mass spawned, ejecting tiny pink and mauve balls representing either eggs or bundled egg and sperm masses as well as cloud-like white slicks known as ‘smokers’ representing individual male colonies. Being in that is like going through an upside-down snow storm,” Mr. Ireland said. Cairns-based marine biologist and educator, Gareth Phillips, will use Calypso Production’s footage as part of a Reef Teach presentation on the Great Barrier Reef. The annual coral spawning, one of nature’s greatest events, takes place every year two to six nights after the October / November full moons when there is little movement of water between low and high tides and when temperatures hover around 80-82F. To follow the progress of the Larval Restoration Project and the annual spawning event, follow Citizens of the Great Barrier Reef on Facebook, Instagram and Twitter (@citizensGBR). Anyone going out to the Reef to view/experience the spawning can upload their images via the Eye on the Reef App or Sightings Network. Visit here for more information: http://www.gbrmpa.gov.au/sightings-network/.